Josh & Shawn from Last Choice Country are spending the Thanksgiving weekend living in a Steven's Cycle Sales Toy Hauler in front of Millar's on Euclid Avenue on Bay City's West Side. The do-gooders duo say they will not be leaving until they have collected 1,500 toys for local, needy and deserving youngsters. 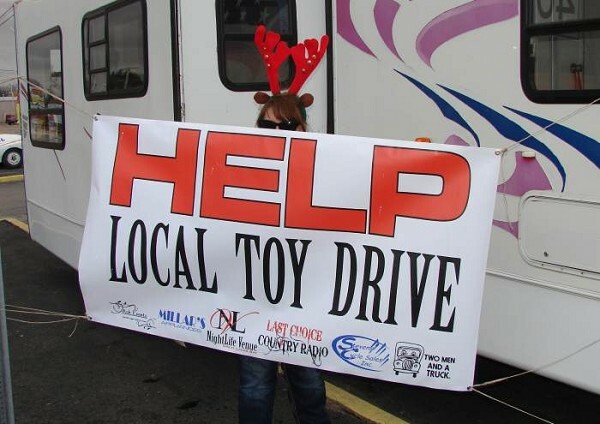 The LastChoiceCountry Radio Team was in front of Millar's on Friday gathering toys for local needy children. Pictured above (L/R) are: Shawn Doyle, Josh Sharrow, Shawn LaMere, Del Paiz and Amy Austin (sitting) at the right. The goal is 1,500 toys. Early Friday afternoon, there were close to 200 toys collected and stored in the Steven's Toy Hauler. The Josh & Shawn celebrity INTERNET radio team is fresh off a previous fundraiser at a Kawkawlin 7-11 where they raised money to replace an i-Pad for a youngster who had broken his Apple device while saving his mom during a traffic emergency. "It's all about the community for us," said Shawn Doyle during the weekend Christmas toy drive. "We just really enjoy giving back to the community," Doyle said. Doyle went on to thank event sponsors 7-11 (Kawkawlin Road), Ash Events, Night Life Venue and Two Men and a Truck for their support. ALL TOYS WILL BE GOING TO LOCAL FAMILIES!! The Steven's Cycle Toy Hauler was at Millar's Appliance on Euclid Ave. starting Black Friday. The gang from Nightlife Venue will be glad to come pick up donations. Call them at 989-545-1816! Josh Sharrow asked local residents to help the community! "It could be your neighbor, your co-worker, a friend of your child who we are supporting," Sharrow said. Sandy Graves (Left) of Bay City stopped by with a toy donation -- A Wispy Walker Doll) "I saw something about the toy promotion on Facebook and brought a toy over," Draves said.